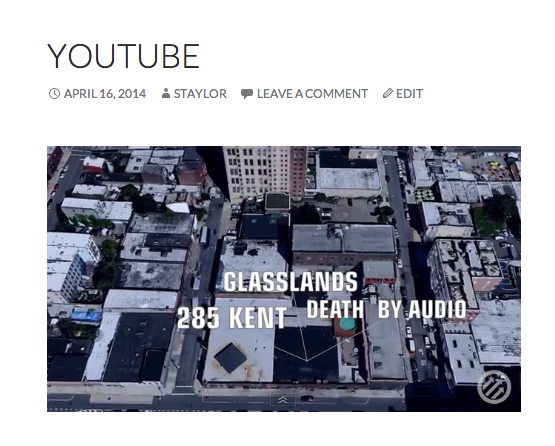 This entry was posted in Programming, WordPress and tagged audio, media, video by Scott. Bookmark the permalink. SO how do you display the Chromeless YouTube in a post or page? Thanks for your amazing work! I’m super excited about playlist support in 3.9, but having trouble working out how to enable them. If I drag 3 MP3s into the post editor and preview, I get three separate MP3 players. 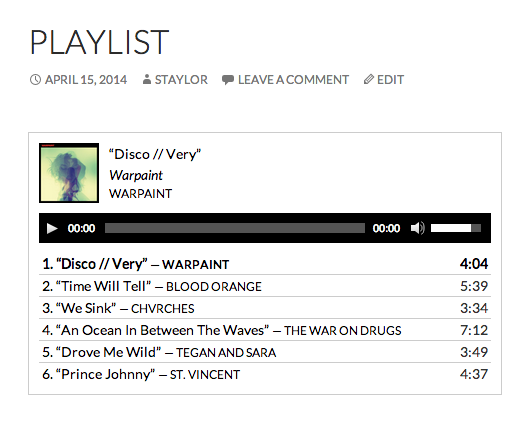 That’s progress, but I can’t figure out how to group them into a playlist, or how to get their metadata to appear. Is there any how-to documentation on this new feature? Thanks. The way I did is when writing a post, after you click the “insert media” button the option to create an audio playlist displays on the menu to the left, then you upload your audio files and the playlist is embeded in your post. Thanks for this news. Your plugin (Shuffle) seems to not work with this new version. Hiya Scott, I’ve been following the work you’ve been doing with playlists and media for 3.9, but it wasn’t until I updated yesterday that I realized how extensive the changes to media-views.js are. 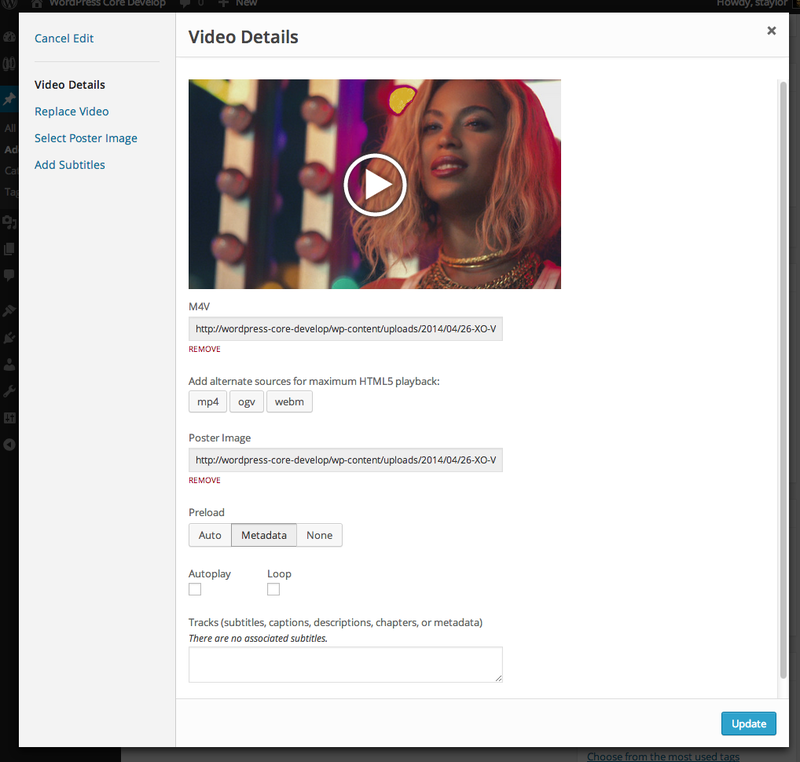 I’ve got a plugin (Featured Galleries) that calls up the media manager, and I’m having a lot of trouble getting it working with the changes. In the new JS file, the gallery and insert states of the post frame are still created, but there’s gotta be something I’m missing that has changed, and I’m wondering if you might be able to help point me in the right direction. Please ignore this comment; I was able to figure everything out … kind of? It works, but I don’t know why the change goes. It seems that in 3.8, one could declare a frame’s PHP variable outside of a jQuery .click function that calls it. In 3.9, the frame’s PHP variable must be declared inside the jQuery function. Hi Scott. This all looks very exciting, but I can’t even get your music (GP) to play in FireFox, Chrome or Opera. FireFox is the only browser that displays a play/pause button. Do I have to do something on my end to enable this stuff? I’m doing a major redesign of a non-profit, non-band audio site that I built a few years ago and your audio/video bonus pack for WP looks intriguing. Getting FFmpeg up and rolling on my shared host was a chore, but now I’m looking for the best way to approach my task. I had hoped I could see this thing in action. Nice! I love the music playlist feature! One question though, how would I change the background color of the playlist from white to something else? white doesn’t agree with my current background on one of my sites. Great work on the audio/video players. I love the simplicity of the audio player. Is there a way to control the width of the audio player? I’d like to minimize the size of the progress bar so that the player is as compact as possible. I would like to know if there is any way to get the audio player via HTML. I have made a post with an audio file inside and i would like to get this audio player on another page. Get_content( post id ) doesnt seems to work. Any suggestion ? 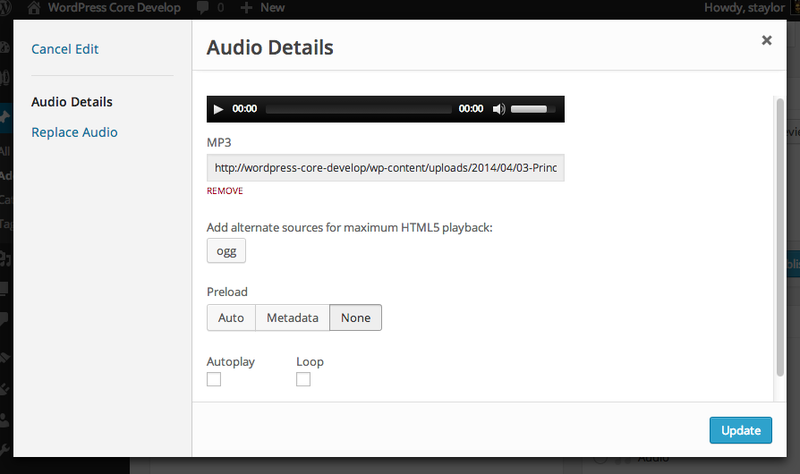 Scott, I’m having a problem where my native WordPress audio playlist loops indefinitely. Is that default behavior? I tried preventing the looping by adding things to the shortcode like loop=”false” or loop=”off” but to no effect. Is there a way to control that? It was the first time I was making a video playlist, It so happens that it coincided with the first release. I was very pleased at the result but realized that there is no way to stop a video playlist loop. It can be done with audio, but not with video. Anyway, thanks for the great addition. This will be nice when the default player calls your actual theme’s default font styles & colors. Right now, no matter your theme, it all comes out designed for wordpress default themes.